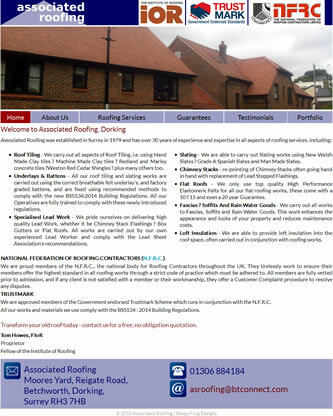 Coverage: Associated Roofing is based in Dorking, Surrey and carries out all types of roofing work. Specification: The company required a completely new, mobile friendly website to replace their existing one which had not been updated in many years. Carol updated our tired and outdated website with excellent results, we are absolutely delighted with the refreshed and current look, which many Clients have commented on. We would not hesitate to recommend Carol, whose expertise and attention to detail we cannot fault.